When I first started coaching women with eating disorders, I believed that binge eating was just another form of emotional eating. Now, I think that some binge eaters may not be emotional eaters at all and vice versa. I still believe that overeaters in general often share similar personality traits but it may be much easier to overcome binge eating than emotional eating. Some women may experience both at the same time. However, some emotional eaters may never binge and some binge eaters may not eat to soothe emotional distress. I have surveyed my customers and of the many women surveyed, none could define which type of overeater they were. If you don’t know which you are, it becomes quite difficult to treat yourself. That’s why I have decided to create a specific article for each type. 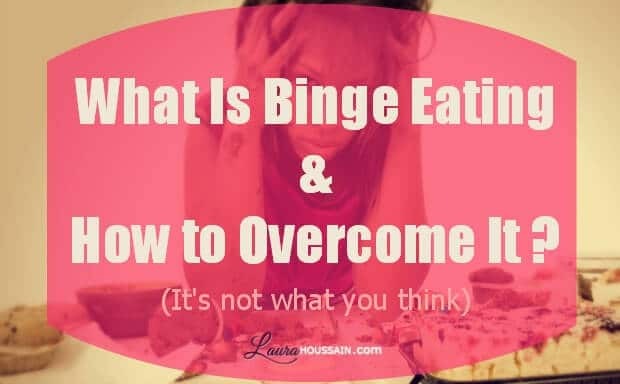 In this article, I explain what binge eating symptoms and causes are and how to overcome it. Common binge eating symptoms also include obsessing on food, recipes, cookbooks or new food fads, products and flavors, eating vast amounts of food really fast, hiding while eating, sneaking food and feeling really guilty after binging and hating the consequences binge eating has on the body while feeling powerless about it. Binge eaters are usually not as selective of the type of food they eat as other food addicts. They mostly want to feel full. This desire for fullness may push them to eat so much that they may eat beyond their body limits and damage their stomachs. A binge can last up to two hours. Apart from rare clinical conditions that make it impossible for someone to assess their hunger, I believe that binge eating is caused mostly by dieting, social influence or a form of self-rejection or fear. Prolonged dieting will cause cravings or binges with food obsession in any healthy individual. I have experienced these symptoms myself in as few as three days. I have no doubt I became an emotional eater during some very stressful times in my life, but I believe I didn’t become a binge eater because I just failed at all my diets. This is what I’ve experienced each time I was on a diet. All of a sudden, I was craving food all the time, feeling some sort of shivers. All I could only think about all day was food. My work was unproductive and I was losing my focus. I started binging. That’s when I told myself that dieting would never work, and gave it up entirely. I have no doubt I would still be experiencing these symptoms if I hadn’t given up dieting. I would probably weigh much more because dieting made me eat more unhealthy, rich food when I binged than I would when I ate normally. I feel very lucky because I grew up in France with a mom who always made sure I had fresh vegetables at every meal and enough to eat. I never once felt hungry while I was growing up, even when all we could afford was pasta, butter , ham and a little salad. Mom never shamed me for eating a cookie or a piece of cake either. Eating was natural, pleasurable and based on hunger. When I moved to New York city, it felt like every store was selling food and everybody was saying the word “fat” or “fattening” at least once every hour. Just hearing the word “fat” makes me feel bloated and tight in my clothes and makes me want to diet. Actually, that’s how I started falling into the low-fat, sugar-free trap and ended gaining a lot of weight. I honestly feel that having no one giving me a critical look when I had some cake was a tremendous privilege. It just doesn’t make me want to have it so much. In other words, the main culprits of binge eating are the diet mentality and the obsessional striving for a perfect body, that perfect look that always makes you feel not good enough, unworthy and not perfect enough. I feel that the forever young and beautiful message is very strong in the US. It can make anyone who doesn’t meet these standards feel not good enough and make others reject anybody who doesn’t meet them too. It promotes what I call compulsive dieting. Compulsive dieting is on the flip side of compulsive eating. Unfortunately, it’s now proven than teenagers who try very restrictive diets even for short periods of time tend to grow into heavier adults than those who don’t. People who diet over long periods tend to lose touch with their natural hunger. They have a hard time knowing what and when to eat. The weight-loss industry is then very happy to tell them what to do in exchange for a hefty fee. Any weight gain or relapse increases their sense of powerlessness and their compulsive eating patterns. They keep on gaining weight and feeling more and more desperate. If that sounds familiar, the first thing to do is to get in touch with your hunger signs again and let your body teach you what and when to eat. This is not the purpose of this article but if you really want to get away from binge eating, you must do everything you can to let your body be the food expert and give up dieting permanently. I know diet experts are really good at selling you good reasons why you should diet. They have hypnotized an entire nation and played at contradicting each other only leaving you more confused. New diet fads crop up every summer with exciting before-and-after pictures and testimonials. It’s so easy to be tempted. But if I tell you that it’s now certain that diets make people fatter in the long-term, do you still feel excited? Try to look beyond the before-and-after picture and visualize the “after-after” picture. You’ll see an even fatter lady than in the ‘before’ picture, because diets cause cravings and binges each and every time. You may be very strong willed and diet for months without binging, but if you eat according to somebody else’s standards rather than your own body’s needs, you’ll end up eating more than you need to at some point. I know a famous fitness instructor who went on a “perfect diet” only to binge uncontrollably after that. She wanted to go back to “eating perfect” but she just couldn’t do it any more. She was so sure that it was her fault when it was not. It was the fault of her dieting and constant deprivation. They led her to ignore what her body was telling her and put so much pressure on her that she just couldn’t take it any more. There can be other underlying psychological reasons for binge eating. For example, I know someone who felt really deprived as a child because her parents couldn’t afford to buy enough good food for the family. Now she tends to binge on gourmet foods, only to diet later. A case like hers would require at least a session with me to allow her to let go of these past feelings of deprivation. In a very short time, she could then allow herself to have some luxury food in moderation. She basically binges as a reaction to a deep-rooted fear of lack of food. Social pressure can make binge eating worse. Maybe it’s your parents, friends at school or the media who gave you these dieting habits or made you feel guilty about your weight. This “I must diet to have a perfect body” mentality is rampant. It makes people either reject others who are overweight or constantly blame them for their lack of will power. Some binge eaters may resort to emotional eating to soothe feelings of rejection. They will eat comfort foods to alleviate the feeling of being trapped in a situation that seems out their control, adding another layer of complexity to their eating pattern. Shame, blame and rejection are usually at the root of any addiction. The answer to this is to practice, self-love and acceptance and setting healthy boundaries with people who put pressure on you. You may also want to join a support group to help you during recovery, but I’m not too fond of the 12 step program, as I explain in my article How to Overcome Binge Eating Disorder with the Twelve Step Program. Nonetheless, it may be a good idea if you feel that you have suffered a great deal of shaming and blaming about your weight and eating patterns. If this is the case, make sure to read my upcoming article about emotional eating as well. Being overweight may be an unconscious strategy to keep yourself out of danger. For example, I have a friend who feels safe being overweight because he was bullied growing up. He mentally associated being thin with being bullied. To make things worse, he was the only thin child in the family, so gaining weight was a way for him to fit in the clan (social pressure). Every time, he loses weight, he has binging episodes and gains it all back and more. His unconscious just won’t let him lose weight because it associates that to a physical threat. I also remember reading a study saying that women who had suffered sexual abuse in childhood were much more likely to become obese later. I remember reading in a book by Geneen Roth, an emotional eating expert, that such women were unconsciously attempting to make themselves less attractive to avoid sexual assault by overeating. Some could argue that this is a form of emotional eating, but it’s not. These people usually eat very quickly, sneak food and have the common binge eater patterns. So binge eating can be triggered by things other than just dieting. However, it seems that most binge eaters have dieted at least twice in their lives. That’s enough for any healthy human being to become a binge eater. Like I said earlier, the first thing to do is to get in touch with your hunger and give up dieting once and for all. It may also mean asking your parents, partners and friends never to blame you when you have some rich or “bad” foods. There are no “bad foods” you can’t eat once in a while if you feel like it. The diet mentality will argue with me but it has failed to show permanent results over and over. It has been shown to promote binge eating and makes your body hold on to fat and burn fat slower*. To eliminate binge eating you may also need to eliminate underlying psychological causes like the fear of being assaulted, or of not belonging in a group that I mentioned earlier. These may cause you to binge just to keep you overweight. You may then try to compensate by dieting. Unfortunately, dieting will make you lose touch with your natural hunger signs and keep you binging and craving foods. To end this vicious cycle, you’ll have to address your unconscious desire to keep yourself overweight. This desire is a desire to protect yourself from a perceived external threat. You just have to inform your unconscious that there are other ways you can protect yourself from harm, and that it’s safe to lose weight now. All you’ll have to do then is to stop dieting and start getting back in touch with your natural hunger. I know it may seem scary because you probably feel that if you stop dieting you will end up binging. Unless you have an underlying psychological reason to keep yourself overweight, you may do so for a day or two, but you’ll soon be surprised how, once all foods are allowed, you may not want them as much. You just eat what you feel like. I could go into more detail here, but that’s not the purpose of this article. This article is to give you an overview of what binge eating is and tips on how to overcome it. Andrew J. Hill (2004). Does dieting make you fat?. British Journal of Nutrition, 92, pp S15-S18. doi:10.1079/BJN20041135. I like your site. I appreciate your posts. Thank you for letting me know Sachin.